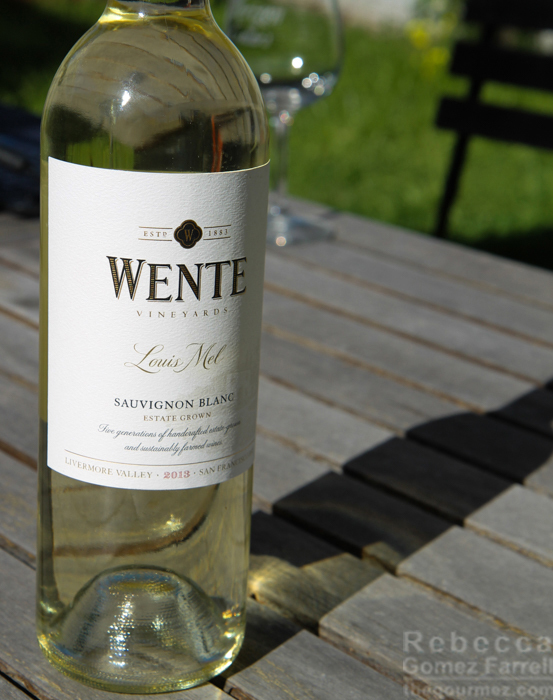 Wente Vineyards is a Livermore-based wine company and family estate vineyard whose roots, literally, extend back to the late 19th century. It’s a brand I’ve become familiar with in the past year, in part because they are featured on Delta Airlines and gave me some much needed relaxation on a flight home from Minnesota. It turns out they are also hosting a pairing dinner at the Wine Blogger Conference 2016’s pre-excursion trip to the Livermore Valley, so I’ll be getting to know these wines a lot more personally come August. The Louis Mel Estate Sauvignon Blanc 2013 is named after a French emigrant to the Valley, whose vineyards the Wente family acquired in the 1930s. It’s a straightforward sauvignon blanc, with a brighter taste than the lush, tropical nose implies. My summary? A pleasurable example of what sauvignon blanc is meant to be: bold citrus served up on a stone or brick platter and complemented with a tropical crème anglaise. Grapefruit, pineapple, breadfruit. Enjoy! in my rating system. Thus far, I’ve only tried Wente’s more commercial wines, which have shown themselves to be good conveyors of the standard profiles we think of when considering a wine, though I did find the merlot dryer than typical. I look forward to trying some of their small lot wines when we dine at their estate at WBC16—consider that an official request. Only three months to go! 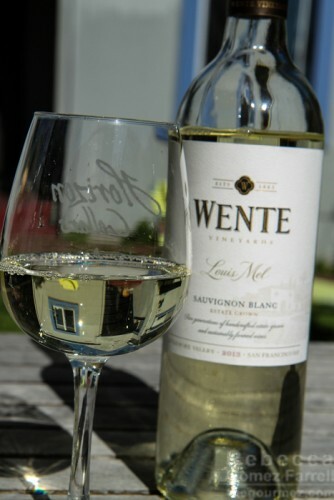 Much like their Morning Fog Chardonnay, the Wente Louis Mel Sauvignon Blanc is tropical but still lean. The bouquet is pungent with white fig, apricots, and almond. The palate is the mirror of the bouquet, but the addition of coriander and orange peel. The finish is light and mildly acidic making it easy on the palate. A well rounded and balanced, but definitively Californian sauvignon blanc. Aromas are lovely, with soft sweet citrus and magnolia wafting up from the glass. 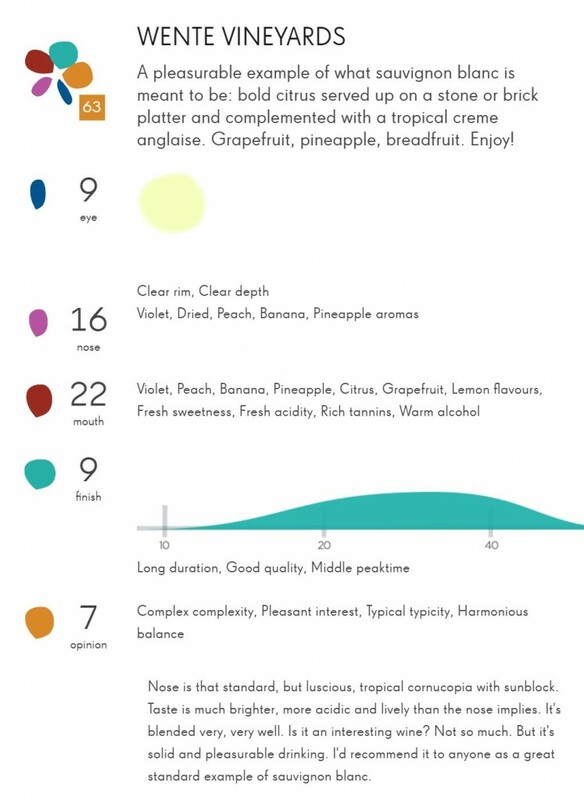 Tight, clearly defined tropical comes out up front on the palate, white grapefruit, mango and Valencia orange. White florals come through on the mid-palate, but not as powerful as on the nose, more orange blossom than magnolia. Freshness comes through with a nice citrus zing. Drink with fried chicken, outside, on a sunny day. Recommended. 88 points.